1979, Starring Peter Occipinti, Neil Ayers, "Big" Al Boyd and Denise Barnes. Directed by Neil Ayers (Culture Shock Productions). When infamous biker club the Hell's Angels established its first Canadian branch in Montreal in 1977, they were already legendary underworld figures whose exploits had been captured in dozens of books and films. The Angels established an immediate presence by absorbing smaller homegrown clubs that had formed throughout Quebec in the 1960s, but before they had the chance to expand further into Canada, the Angels found themselves challenged by the Outlaws, another American biker club that had recently started a chapter in Ontario. The resulting rivalry between the U.S. gangs resulted in a marked increase in drugs, illicit firearms and gang violence in the country, terrifying Canadians who had already seen a steady rise in urban crime since the 1960s. 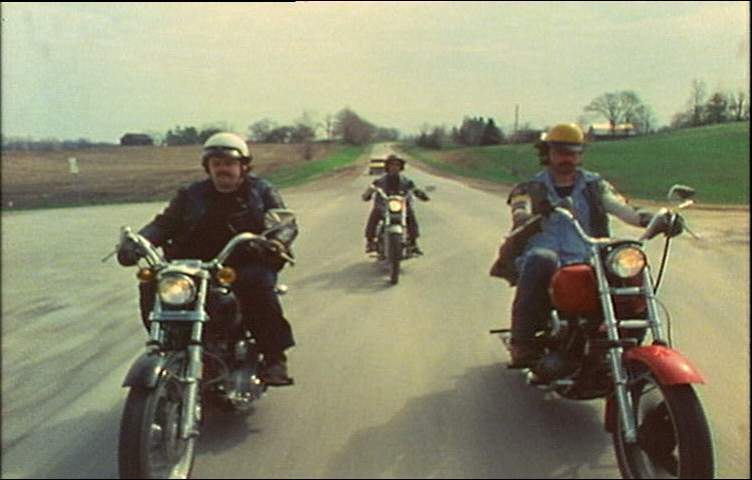 While most of the American films that had been made on the subject of outlaw bikers were cheap, drive-in fodder that rode the coattails of the Angel's real life exploits, Canadian directors took a decidedly more naturalistic approach to depicting tough, leather-clad bikers. Members of Canada's first motorcycle club, the Black Diamond Riders, appeared in William Davidson's 1959 film The Ivy League Killers as law-abiding citizens, and Toronto's Satan's Choice Motorcycle Club, who later joined the Outlaws, were the subject of a 1965 documentary by Don Shebib. Filmed in London, Ontario just as the Angels formally declared war on the Outlaws, Neil Ayers' The Death Lords is a Canadian trash classic that riffs off of American exploitation films like The Wild Angels and The Glory Stompers, while offering a satirical take on biker culture and crime that had recently manifested north of the border. Alvin "Street Smarts" Axoltl (Peter Occipinti) and his cronies Boris " Dr. Weird" Cowznofsky (writer/director Neil Ayers) and Chuck "Brain Damage" Potrzebie ("Big" Al Boyd) are The Death Lords, grimy hawg jockeys who describe themselves as "the meanest motherfuckers on the planet." In truth, they're barely competent, even by biker gang standards, spending their days beating up little girls and trying to dissuade bespectacled, scooter-riding Harvey (Tom Nursell) from his dream of joining their not-so-vicious ranks. Eventually, while out on a potato chip run, Street Smarts meets the beautiful Angel Evilia (Denise Barnes), and invites her to a weekend getaway with the others. The gang heads off to the lavish house of an adult film producer to procure a suitcase full of cocaine for the occasion, but an unexpected police raid leaves everyone dead except for the Death Lords, who grab both the drugs and the money and head out to their "Top Secret High Command Retreat Chateau." But when Evilia arrives for the party, she reveals that she's really an undercover agent of the devil on a secret mission to destroy the Death Lords--apparently, they just aren't living up to their evil potential. Despite barely-there production values and the flimsiest of storylines, The Death Lords is an enjoyable little Canadian genre spoof that prefigures later Canadian cult classics like Big Meat Eater and Crime Wave. In this film, the plot is really besides the point, anyways--The Death Lords is really just a series of comedic set pieces put on by a cast of inept outlaws. From driving a fiery station wagon down the street to shaving a stoned Dr. Weird's head and outfitting him with a wig to make him think he's Dolly Parton, Ayer's film is a veritable parade of calculated idiocy. 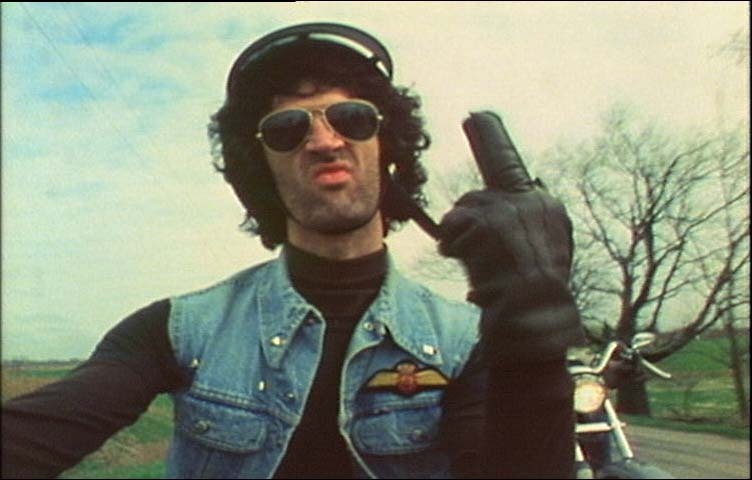 The Lord's lackadaisical approach to the biker lifestyle, which mostly consists of ingesting illicit substances and playing juvenile tricks on each other, is surprisingly well portrayed by Occipinti, Ayers and Boyd, who bring an improvisational energy to the scenes and use the humour of their characters to draw together the otherwise episodic plot. The Death Lords is very much a product of its time and place, taking a distanced, but playful look at the proliferation of biker clubs in Canada, but it has aged magnificently. The low-tech special effects should be completely ridiculous by now, but they're not--animated blasts of lightning and the trippy, psychedelic scenes of a female Satan giving orders to Angel Evilia lend the film a cheap, drive-in charm. That The Death Lords remains as fresh and laugh-out-loud funny as it was when it was made is a real testament to the filmmakers involved, and it would have been fascinating to see what else Ayers and his motley crew could have come up with, given a bigger budget. Although the gang is supposedly based in Oakland, California, there's no mistaking The Death Lords for anything but a Canadian film. Tapping into the wonderful tradition of Canuck parody on film that stretches from the early 1970s through to modern day efforts like FUBAR, the film features several documentary flourishes, including a cinema verite style and a nasal-toned narrator who occasionally breaks in to recount tales of the Lords' criminal cowardice. Like most micro-budget Canadian efforts, the film also makes the most of its rural setting, offering a portrait of life in small town Ontario at the end of the 1970s, including a nostalgic visit to a corner store stocked with decades-old foodstuffs. Missing in action for almost 25 years, John Temou of Culture Shock Productions rescued The Death Lords from the junk heap, purchasing the film and releasing it on DVD with a newly created cycle-delic soundtrack by the Tijuana Bibles, an animated credits sequence and some minor edits. For trash aficionados, it's a damn lucky thing he did, because The Death Lords deserves to be seem--it's a unique, no-brow ode to all that is great in the history of Canadian cult cinema.